It’s that time again folks! Wizards of The Coast is at it again attempting to absolutely destroy our wallets with another amazing new Magic: The Gathering set! This time we have Hour of Devastation, the follow up to April’s Amonkhet. This time around Jacob was out of town, so I attended a prerelease event at my local gaming store, Cardboard Castle Games. If you are not familiar with Magic, this is, as always, not the way to learn, as I’ll be talking about all kinds of different things that may or may not make sense. There are several different outlets to learning the game though. Find yourself a local game store and see if they offer any events to newcomers, if not, most people in your local stores will be more than happy to both make a new friend and teach them about something they enjoy! You could also visit Wizards’ official primer page, download Magic Duels, or watch a youtube program such as Sean Platt’s Spellslingers. It’s important to note that this review will not have a score, since there’s any number of ways that a set of about 200 cards can affect the game through several different formats. Unlike Jacob, I don’t necessarily play Magic causally. I tend to play in more competitive, constructed formats of the game, Modern being my primary focus at the moment, so my focus on how good an individual card may be a bit skewed by the idea of what you could possibly do with it in another format. Hour of Devastation follows up where Amonkhet left off. Nicol Bolas, the ancient dragon planeswalker, has returned to Amonkhet to fulfill his nefarious plot of… well, basically eating the world to regain his strength as a near-godlike being from prior to The Mending, which took place several decades earlier. To this end, it is revealed that 60 years ago, Nicol Bolas came to Amonkhet, killed 3 of the plane’s gods, and enslaved the remainder of the plane’s inhabitants so that he would eventually have an immortal army or something? It’s weird. All you need to know is that he’s an evil dragon doing evil dragon things, like trying to eat entire planes. Also there are mummies as well as a zombie crocodile demon. By the way, you remember Liliana Vess? She had a pact with a demon on Amonkhet. He decides to show up and attempt to collect on her debt. Unfortunately for Razaketh (the demon), Liliana has four of the other five members of the Gatewatch with her, and they kill him. But not before the entire plane starts going the way of the Egyptian Plagues (You know, from the Bible?). Razaketh turns the Luxa river to blood, then guess what! The other 3 gods that we thought Nicol Bolas killed come back! Unfortunately, they’re not friendly. The Scorpion God kills Rhonas (snek god), The Locust God unleashes a horde of locusts which destroy the Hekma (barrier) protecting the ONLY CITY ON AMONKHET. Things are just going downhill fast out here on Amonkhet. Bontu (crocodile god) betrays Hazoret (jackal god) to Nicol Bolas, because it turns out Bontu knew about Bolas’ plan the whole time! Bolas kills her though and Hazoret seems to be the only god that will survive the ordeals of Hour of Devastation. For mechanics, we’ve got the return of -1/-1 counters as well as the return of cycling and aftermath. I won’t touch on those as much as the new mechanics as Jacob covered these in his review of Amonkhet. We also have a new mechanic: eternalize. Eternalize is much like embalm in that you pay a cost and exile a card from your graveyard to put a token copy of that card onto the battlefield. However, unlike with embalm, any eternalized creature becomes a creature with power and toughness 4/4, meaning that they could either be stronger or weaker than their original counterpart! At rare, we have what I’m calling the “Timewalk” cycle of cards. These cards offer extremely useful abilities that can turn a game around. Each card is “(God’s) Last (Action)” aside from the red card, which is named “Hazoret’s Undying Fury.” The use of these cards however, can be extremely risky, as they force your lands to stay tapped on your next turn. Meaning any spell you play for the remainder of the turn you cast a timewalk cycle card has to be EXTREMELY worth it. Also at rare, we have the “Hours” cycle. These cards are each named after an hour within the lore. There are the hours of Revelation, Eternity, Glory, Devastation, and Promise. Each of these cards seem as though they could be extremely useful, particularly the "Hour of Revelation" and "Hour of Devastation," as they will clean the board of any possible threats. Though these cards are powerful, their high mana cost reflects that they may not necessarily be worth playing. At uncommon, we have the “Defeat” cycle. Each card in this cycle shows how Nicol Bolas, the God-Pharaoh of Amonkhet, defeats each member of the Gatewatch that came to challenge him. It remains unclear if Bolas has killed these planeswalkers, though popular theory has said no, due to image leaks of cards from the next set, Ixalan. Also at uncommon, we have a cycle of lands that are deserts. Each of these lands taps for a colorless mana, or you can pay 1 life to have it provide you with a single colored mana of that land’s type. These lands each additionally have an activated ability based on the color of that land: the white one gives your creatures +1/+1 until end of turn, the red one deals 2 damage to each opponent, etc. The only downside to these lands is that in addition to paying a mana cost, you have to sacrifice a desert land to activate them. Finally, at common, we have the “Gods” desert land cycle. Each of these lands shows the ruins of the monument to the respective god of the same color. These lands come into play tapped and add just an individual mana of their respective color to your pool. You can also cycle these lands for two mana. Nicol Bolas’ new card is a 7 cost and starts with 7 loyalty counters, as the theme of 7 with the Elder Dragons is definitely a thing that exists. This version of Bolas is VERY multiplayer friendly: he can target an individual player with his +2 ability, or EACH opponent with his +1 ability. This card stops players, lands, artifacts, creatures, and enchantments from getting counters. That means no energy counters, no +1/+1 counters, no poison counters. There are so many ways you can use this card. Play "Solemnity," then play a "Dark Depths" and you have a 20/20 flying indestructible Marit Lage for 3 mana. Boom. I just don’t like Jace, so this card makes the list. One of Liliana’s demon masters (though, they killed him, so now she only has one master remaining to hunt down), Razaketh is an 8/8 flying, trampling body for 8 mana that lets you tutor through your deck for any card by paying two life and sacrificing a creature. He’s here to find some cards and collect some debts, it seems. The title card of the set. This card can be absurdly powerful. 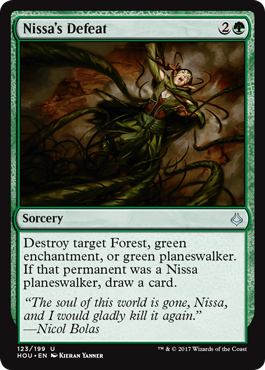 It forces creatures to lose indestructible, then deals five damage to each creature, and each planeswalker that isn’t Nicol Bolas in some form of another. That’s absolutely crazy but absolutely powerful for five mana. This creature is a 2/3 body for 3 mana whose ability reads: “You may play land cards from your graveyard.” This card is a crucible of worlds on a body and I love it. I need one for reasons. My prerelease experience… wasn’t the best. As is usual for my luck with sealed pools, I didn’t get much that worked well together. My brother and I participated in a 2-Headed Giant event, lost the first two rounds, and promptly went to get something to eat and see Spider-Man: Homecoming. Overall though, Hour of Devastation seems to me like it will have a lot of cards that will see play. Stay tuned for our review of Ixalan the week of September 25, 2017! This review was supported in part by Cardboard Castle Games, located in Evans, GA. Cardboard Castle Games offers the newest and hottest CCGs and board games, and sells sleeves, mats, deck boxes, dice, and more. Check out their store and website for Hour of Devastation and Amonket singles, or boosters for your next draft! All artwork and cards are owned by Wizards of the Coast and are used here for review purposes only. Geekundspiel makes no claim to ownership of these materials, nor do we endorse the complete destruction of an entire plane of existence for the purposes of crafting an undead army.